Your allure increases when you wear the Allure Combination Necklace that allows you to flaunt not one, but two of your favorite Dots. Whether you choose matching or contrasting Dots, your combination will be beautifully shown off in this striking foundation. When I want to be bold, this is my go-to necklace. It is the perfect length for V-neck sweaters, since it has a shorter chain. You can be matchy-matchy with this piece or wear contrasting Dots. I love to wear the Photo Statement Dot with my kids' picture, along with the Mom Dot. This is a must-have for your jewelry collection! I love the creativity that comes from combining two Dots together. This Allure necklace is so much fun; I get compliments on it whenever it's worn. The Allure line goes with so many Dots! It's hard to choose, but easy to wear. This necklace is the perfect piece to wear and show off a Statement Dot as well as an original Dot. It's very lightweight but has the look of a quality piece. You won't be disappointed in this necklace. Nice length and the option to mix designs. I just got this and absolutely love it! I like to wear the statement and the matching Dot together, but can also mix and match according to what I am wearing. This is my favorite necklace! I recently purchased a zebra print blouse and look forward to wearing the Zebra statement and original Dots with it. I get lots of comments on my outfit! I absolutely love the Allure line! I have multiple pieces in this line. I love the baguettes and rope accent on this piece! I always get lots of compliments on it. I love trying new combinations of Dots with this necklace! I really like this chain as well! This is one of the most amazing foundations! I love the combination of the Fuchsia Deco Dot in the top and the Pink Cancer Ribbon Statement Dot! Awesome! I really like this necklace. The option for 2 Dots of different sizes is very creative. The rope edge adds extra beauty. Glad I bought this! I love this necklace because it goes very well casual or dressy! It's the perfect length chain and you can have so much fun picking out coordinating Statement and orginal size Dots! I absolutely love wearing the Allure Combination necklace. The thing I love most about it is you can wear 2 of your favorite Dots together in this necklace. There's many different combinations to choose from with all the fabulous dots Style Dots has to offer. 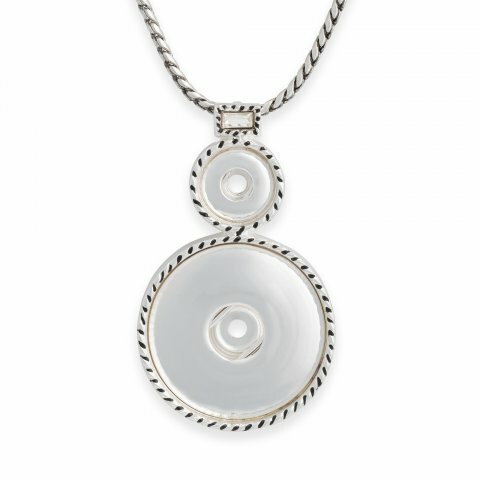 This necklace was my first Allure purchase and I wear it quite frequently! I was at a fundraiser event a few weeks ago and I wore this Allure piece with the Fire Courture Statement Dot with matching original Fire Courture Dot, I received so many compliments on this necklace and Dot's...It was quite literally a Show Stopper! This is my favorite of the Allure line!! WOW!! This is a very eye popping piece. I get to show off the bold statement Dots and at the same time a perfect complimenting original Dot. I get the best of both worlds with this necklace.